This lesson, urinary system for Kids, teaches you all what you should know about the human urinary system. The human urinary system is also known as the urinary tract. Learn how urine is produced in your body and how you pass it out each time you visit the toilet. Human urinary system for kids! Now, let’s learn the parts of the urinary system with this lesson, urinary system for kids. The urinary system also includes some large blood vessels and nerves go in and out of the system. 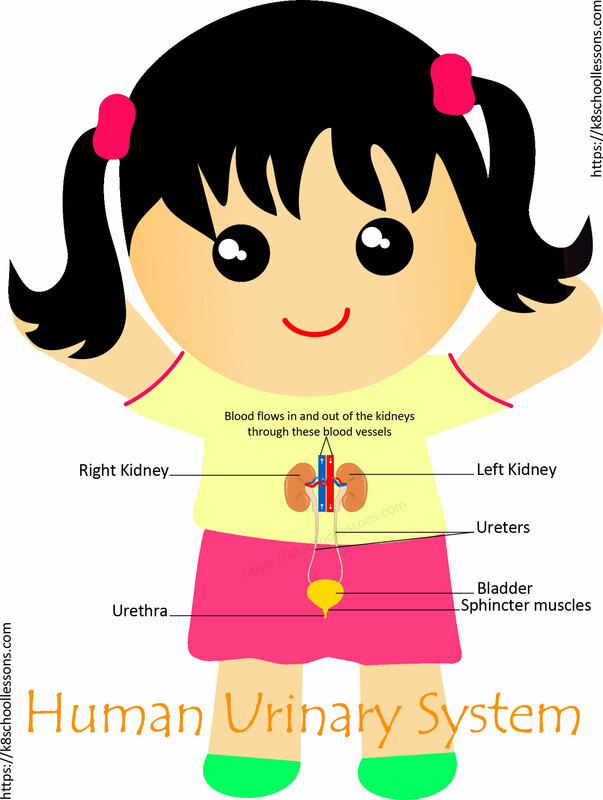 To study the human urinary system diagram, look at the following diagram of urinary system for kids lesson. 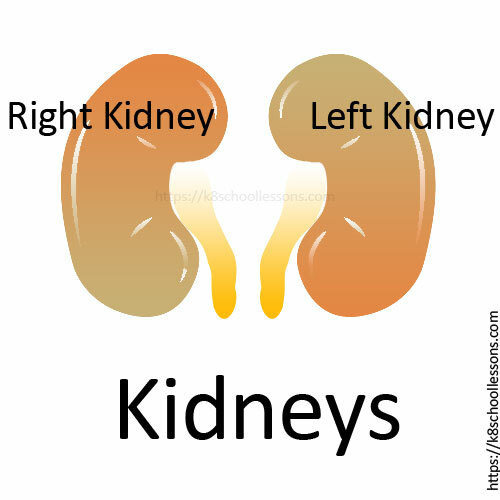 The kidneys are a pair of large bean-shaped organs found at the back of the abdomen. If you put your hands on your hips and your thumbs on your back, your kidneys are next to your thumb tips. Next, learn how kidneys filter and clean blood and produce urine with this lesson, urinary system for kids. 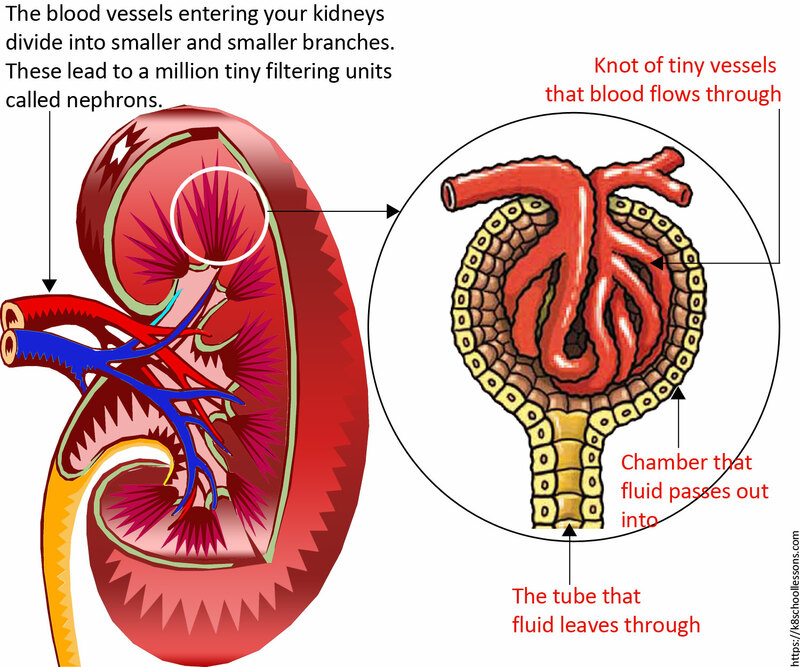 How do kidneys filter and clean blood and produce urine? The kidneys clean your blood that flows in and out of the kidneys through their large blood vessels. Renal artery supplies the kidney with blood. Renal vein carries the blood filtered by the kidney. Urine dribbles away through the tubes called the ureters connected to each kidney. Look at the following urinary system for kids lesson’s diagram. It shows the functions of the kidneys. The blood vessels entering your kidneys further divide into very tiny branches. These lead to a million teeny weeny filtering units called nephrons. What it looks like in a nephron? Fluids leave the blood vessel and pass to a long, looped tube as blood flows through a nephron. Useful chemicals are then reabsorbed into blood. Look at the following urinary system for kids lesson’s diagram. It shows what it looks like in a nephron. Ureters are the tubes that carry excess water and toxic waste away in the form of urine, produced by the kidneys to the urinary bladder. They connect the kidneys and the urinary bladder. Carrying away urine produced by the kidneys to the stretchy bladder to store. The urinary bladder is a stretchy, muscular bag. It has a waterproof lining to stop it leaking. Collecting and storing urine until you are ready to visit the toilet. Urine trickles out of each kidney, all day long, passes through the ureters into the bladder. The bladder stretches as it fills up. This sends a signal to your brain, making you want to go to the toilet. 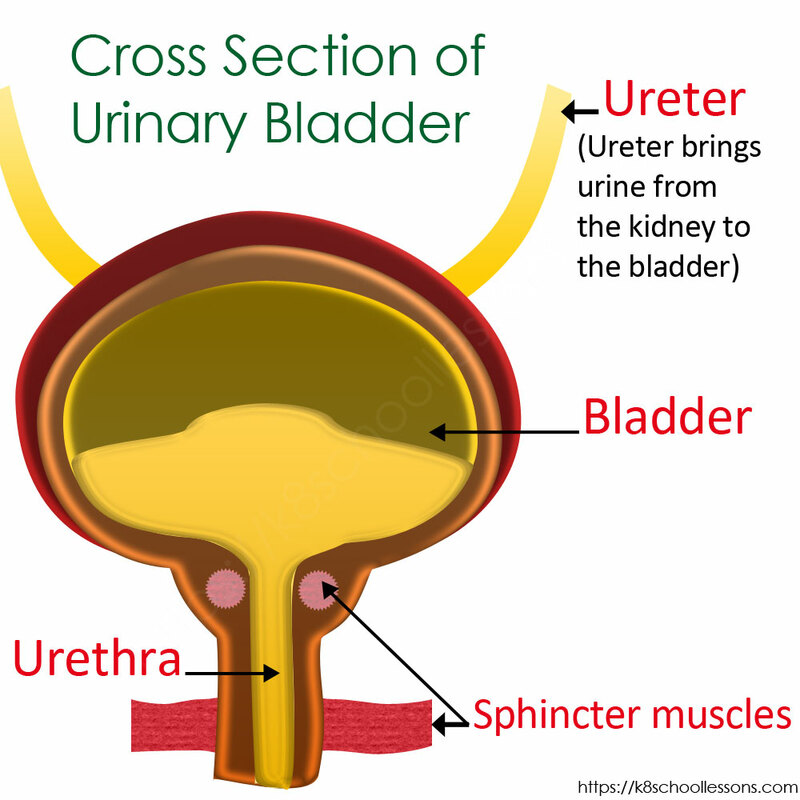 Urine flow out of the urethra when the sphincter muscles in the bladder open. Look at the following urinary system for kids lesson’s diagram. It shows the cross section of urinary bladder. The last part of the urinary system is the urethra. This is the tube that urine comes out of when you go to the toilet. It is normally kept shut by two muscles called sphincter. In young children, the muscles that open the bladder work automatically. 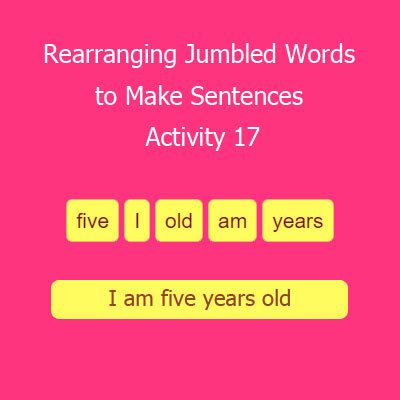 As children get older, they learn to control one of the muscles. 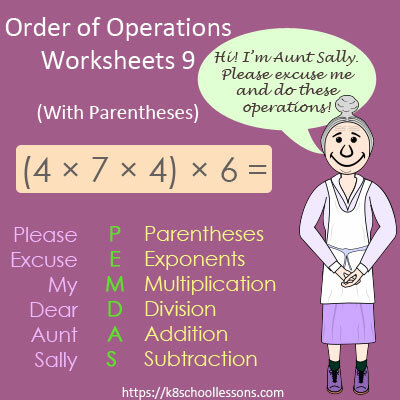 What size is your bladder? To hold about 500 ml (1 pint) of urine, an adult’s bladder stretches from the size of a plum to the size of a grapefruit. This is the full stretch of an adult’s bladder when it is full. The full stretch of your bladder is about the size of an orange when it is full. Look at the following urinary system for kids lesson’s diagram. 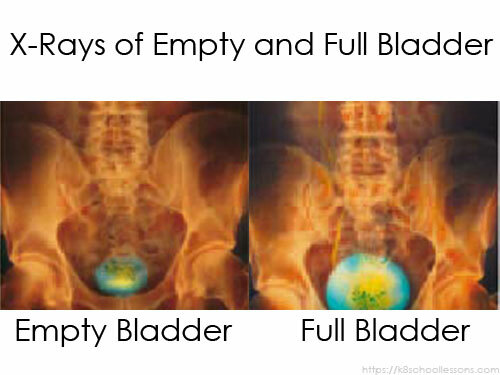 It shows the x-rays of empty and full bladder. 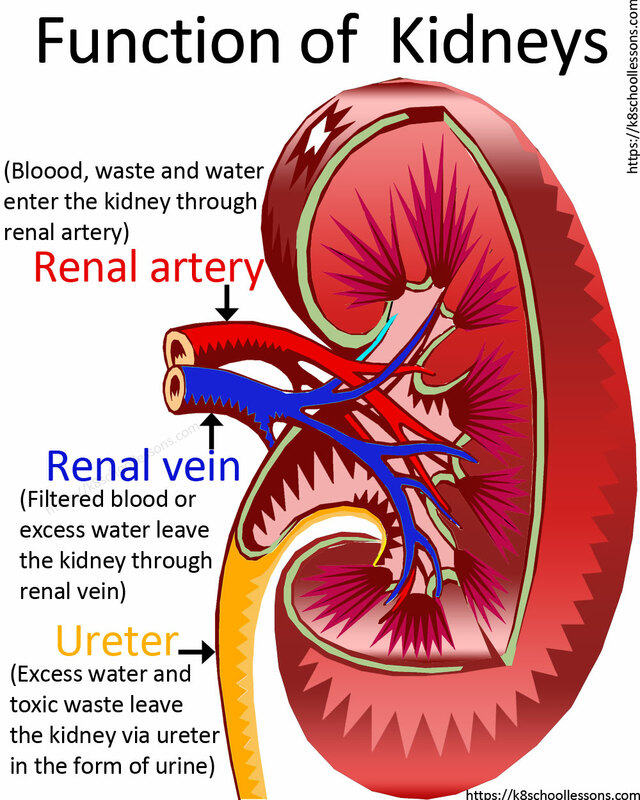 How do kidneys keep the right amount of water in the body? Kidneys make about 1-2 litres of urine everyday and they keep the water level in your body perfectly balanced. If you drink a lot with no or less exercise, you will need to urinate more. This is because when you drink too much, your kidneys make watery urine to get rid of any excess. More you exercise less urine your kidneys will make. This is because, you lose more body fluid in sweat. Urine, or the way you call it, pee or wee, is a liquid waste that your kidneys make to get rid of waste chemicals, and excess water. It is made mostly of water and a lot of salty chemicals such as sodium, potassium and chloride. The main waste is urea, which your body makes when it breaks down protein. The salty chemicals would be harmful if allowed to build up in the body, so the kidneys in the urinary system get rid of them for us. Urine is yellow-orange fluid in colour. The yellow colour comes from a chemical that is made when old blood cells are broken down. However, the colour of urine depends on how much you drink. If you drink lots of water, your urine will turn pale. The body also loses its water and salt in sweat. Millions of tiny glands in the skin release sweat liquid on to the surface of the body. When you get too hot, sweat cools you down. Following are some of the ways that your body gets rid of water. More than half of the water leaves your body as urine. Your body gets rid of over a quarter of the water by breathing. About one twelfth of the water leave your body as sweat. Contains only a little bit of your liquid waste. The kidneys work together with the brain to control the body’s water level. The brain releases a hormone that makes the kidneys save water, when the water level is low. If the water level is low, the pituitary gland releases the hormone ADH. ADH travels to your kidneys in your blood. Your kidneys save water, making your urine stronger. 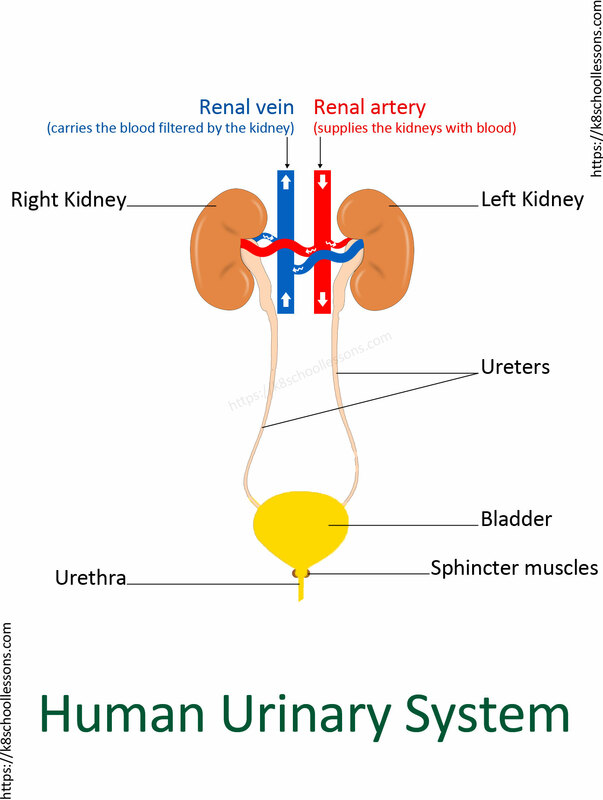 Why do the kidneys make chemical signals or special hormones? The number of new red blood cells are made by marrow in the middle of our bones is controlled by one of the kidneys, while the other kidney helps to control blood pressure, or how hard blood is pumped around the body. The heart sends 72 litres of blood through the kidneys every hour. Therefore, the kidneys have a very rich blood supply. Receiving a kidney from someone else to replace a diseased kidney is called a kidney transplant. Kidney transplants save thousands of people with diseased kidneys every year. A dialysis machine, which is like an artificial kidney also does the work of the kidney and helps people with kidney disease.